Lewis is an experienced advocate and undertakes work in all areas of criminal law. He has experience of defending jury trials which include; serious violence (Section 47, 20, 18 OAPA 1861), motoring offences, Robbery, Burglary, Fraud, sexual and drugs offences. Before joining Chambers, Lewis spent a number of years as in house-Counsel at a large solicitors’ firm in the North East. 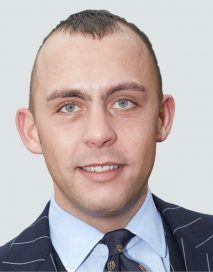 He completed pupillage under Mr Andrew Finlay and has gained a wealth of experience, particularly in defending in Proceeds Of Crime Act 2002 matters, both in relation to the substantive offences created by the Act, pre and post-charge Restraint Orders and post-conviction Confiscation Orders. In managing a busy practice in a solicitors’ firm, Lewis has gained first hand experience of providing excellent client care and is always exceptionally well prepared. Along side his practice, Lewis has appeared as a guest lecturer to graduate law students, giving lectures and seminars on core subjects on the University syllabus and on the subject of his Masters dissertation, ‘Partial Defences to Murder’. He has acted as a mentor and judge for schools in the National Bar Mock Trial competition. B et al v DPP – Appeared for three defendants convicted in the Magistrates’ Court of a Religiously Aggravated Public Order Act 1986 offence. All convictions were successfully overturned following a day of legal argument. R v T et al – Lewis has gained considerable experience in cases requiring careful analysis of large amounts of used and unused material. Led by Mr. Sailesh Mehta in a multi-handed drug conspiracy in which we represented the wife of a Northumbria Police constable who was alleged to be part of a national drug syndicate. Following a 3-month trial and 10,000+ pages of evidence, ours was the only defendant to be acquitted on all counts. R v S – Complex money laundering case. E-bay was used to steal bank transfers from unsuspecting consumers. Negotiated plea reached in which the Crown conceded they could show no benefit to the defendant and all fraud counts were withdrawn. R v M – Successful acquittal for a defendant allegedly observed at close range by 7 police constables to have driven dangerously through a pedestrianised city centre. R V H – Successful acquittal for a defendant who was accused of fleeing the police in a 40-minute police chase. It was alleged he had taken part in a roadside stop check before running to his car before making off. The defendant was picked out by a police officer on an ID procedure. The case rested on the thorough cross examination of investigation and identification witnesses and the presentation of a long history of vehicle ownership and exchanges. R v S and Others – Represented the lead defendant in 32 handed Violent disorder trial which lasted two weeks. The incident arose out of English Defence League Demonstrations. The defendant, a self-styled neo-Nazi disputed the evidence of 17 police officers. R v R – Represented a 19 year old charged with the robberies of two boys aged 15 and 16, one of whom suffered with chronic fatigue syndrome and ‘special-measures’ were not opposed. The defendant accepted following the victims with a group but not participating. ‘Joint enterprise’ was relevant. The Crown’s application to adduce bad character of other robberies, thefts and assaults were successfully opposed. The victim was cross examined via live TV link to his home. A not guilty verdict was directed following a successful Galbraith submission.